Dr Natasha Stephen is a lecturer in the School of Geography, Earth and Environmental Sciences as well as the Plymouth Electron Microscopy Centre at Plymouth University. Natasha came to Plymouth in autumn of 2014 after completing her PhD in Planetary Geology at the Natural History Museum and Imperial College London. 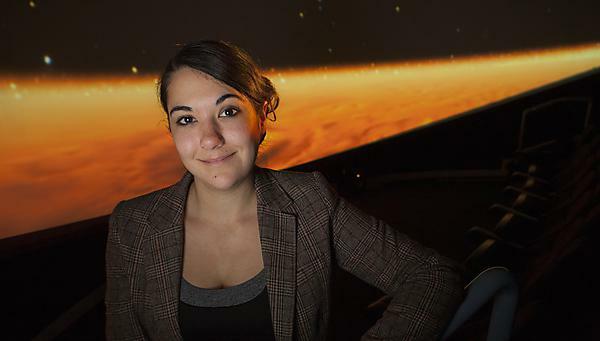 Natasha’s research focuses on the use of meteorites, i.e. rocks naturally delivered to Earth from Mars, the Moon and asteroids, to study the geology of extra-terrestrial bodies throughout the solar system and links these up to the space missions studying these from afar. Whilst the search for life on Mars is one of the key driving forces behind Martian rover exploration (e.g. Curiosity, Mars Science Laboratory), Natasha’s research instead focuses on the geological evolution of Mars, alongside other volcanic regions in the solar system, in order to determine their histories and relevance to Earth’s future. Outstanding achievement medal - Imperial College London (2014) for contributions to public engagement and outreach on behalf of the University. Graduate Teaching Associate of the Year - Imperial College London (2014). Brian Mason Award - International Meteorite Collectors Association (2012) for PhD research into meteoritics. Geological Remote Sensing Group Student Prize - Geological Society of London (2011). Lunar and Planetary Institute Career Development Award (2010). Natasha has been interviewed and featured by Diamond Light Source and the Natural History Museum on her work, as well as interviewed by BBC Radio Devon and featured in the BBC Sky at Night magazine. She has participated in the national Soapbox Science twice, in London for 2014 and Bristol in 2015, I’m A Scientist, Get Me Out of Here! for the Astronomy Zone as well as being an invited participant in the London Astronaut Training School, Stargazing Live at the Harwell Science & Innovation Campus and co-developing and chairing the Geological Society of London’s ‘First Geologist on the Moon’ event in October of 2015. The astromaterials Natasha studies are a finite resource, therefore it is important that research using meteoritic samples preserves them for future study. As such, Natasha employs a range of non-destructive analytical techniques within the University’s Electron Microscopy Centre on campus to look inside the rocks using X-rays to determine their composition and crystal structure.